At this year’s Menus of Change conference here at the CIA, our focus was directed largely at the ongoing quest to create a more sustainable future of seafood. With 90% of our seafood in the U.S. being imported and a reported 65 billion pounds of by-catch, we in the food world have a large responsibility when it comes to what fish we put on our plates. 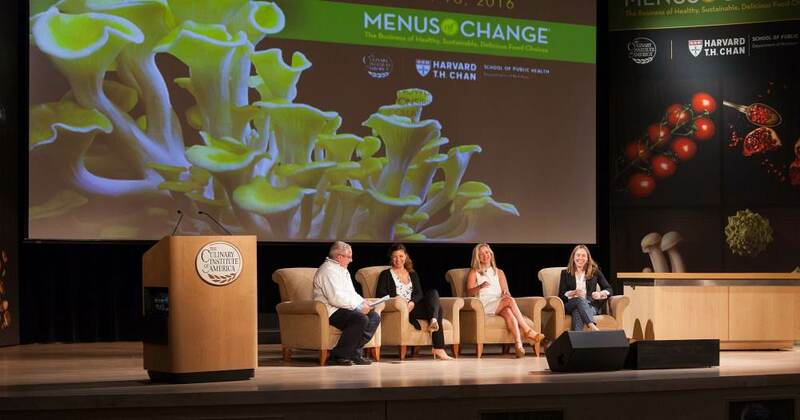 Menus of Change serves as a meeting of the minds for environmentalists and professionals in the foodservice industry to have a conversation about what we can do to better feed our planet without depleting it. After many movements towards a more sustainable sea, it appears that the next step is to engage the consumer. “What we do when we engage markets is we calvanize things,” says Jennifer Dianto Kemmerly, the director of Monterey Bay’s Seafood Watch program. The Seafood Watch program, started by the Monterey Bay Aquarium, is a guide to the wide world of seafood through the lens of sustainability and social awareness. Seafood Watch guides have been distributed widely here on campus and there are over 50 million in circulation nationwide. The guides are region-specific and operate through a simple color system. Seafood like farmed Arctic char and Albacore tuna are considered some of the best choices you can make. On the other side of the chart lie things like mahi mahi and octopus, which the list says you should avoid. However, this is where consumer power comes into play. Kemmerly says that this list is merely a suggestion as to what research you should do in order to make an informed decision. “Avoid them if they’re not willing to make improvements, and if they are, support that!” If a certain kind of seafood is in the red ‘avoid’ section but you find farms that are trying new things to make their product more environmentally conscious, you as a consumer should support this push towards sustainability. The goal here is to create a consumer demand for unknown and underutilized seafood to offset the overconsumption of popular ocean food sources. “Policy reform is complex,” says Kemmerly, “but the market can be a catalyst.” Instead of working to pass legislation that will, more likely than not, die before it is ever enacted, the more viable solution is to change the way the consumer looks at the endless varieties of seafood that can come from our oceans. We as food industry leaders (and leaders-to-be) have an incredible responsibility to the consumer to guide them in the right direction by introducing them to delicious seafood that they may have never heard of. In doing this, we arm the consumer with more knowledge to go forth and make sustainable food choices. Aaron Boisvert is a Senior in the Applied Food Studies program at The Culinary Institute of America. Originally from Connecticut, Aaron has studied Food Systems, Food History, and Food Policy during his time at the CIA. With his degree, Aaron hopes to work in education, helping children understand how to make better food choices for themselves and for the environment.